Dictation 20 1. bell service / 2. Chief / Head Concierge 3. 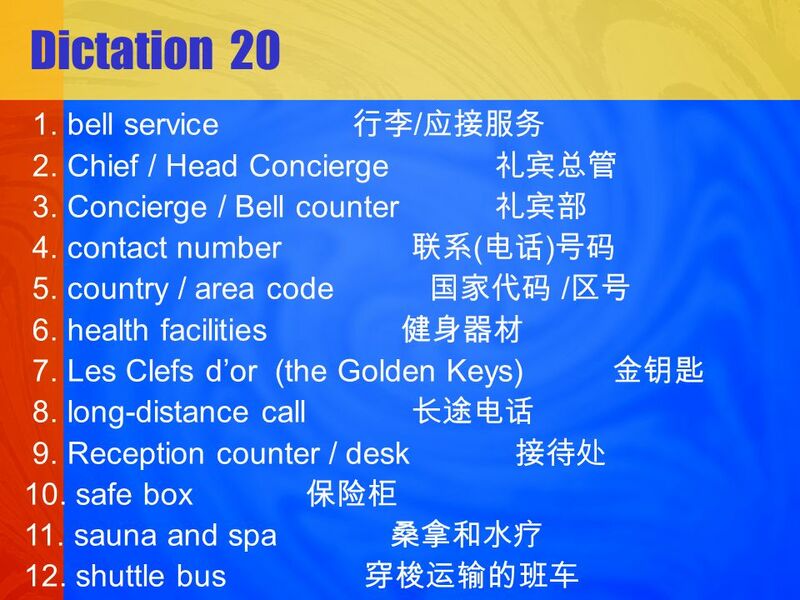 Concierge / Bell counter 4. contact number ( ) 5. country / area code / 6. health facilities. 4 3. Check your understanding. a. 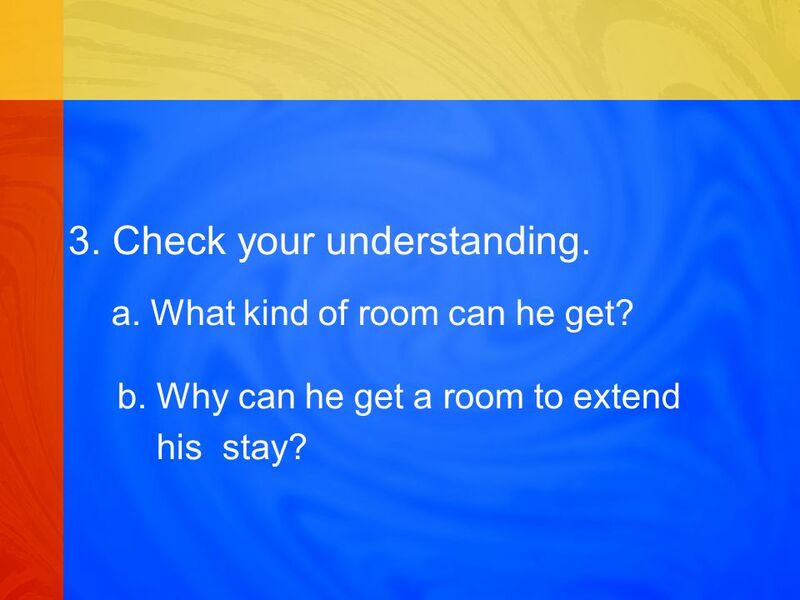 Why does the guest take the room on the top floor? b. What does the receptionist ask the guest for? 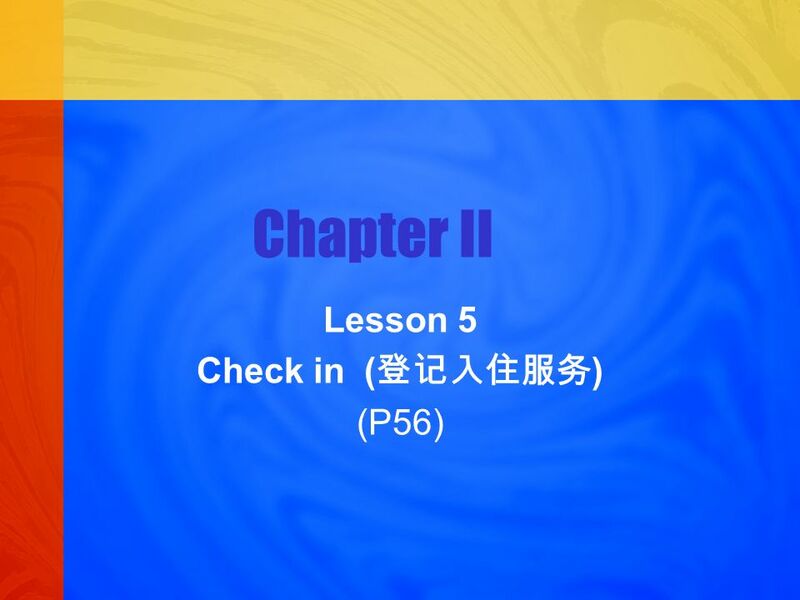 5 Sample Conversation B: Receiving a Walk-in Guest ( ) 1. Please read Conversation B to see if you have any problems. extra charge 2. Check your understanding. 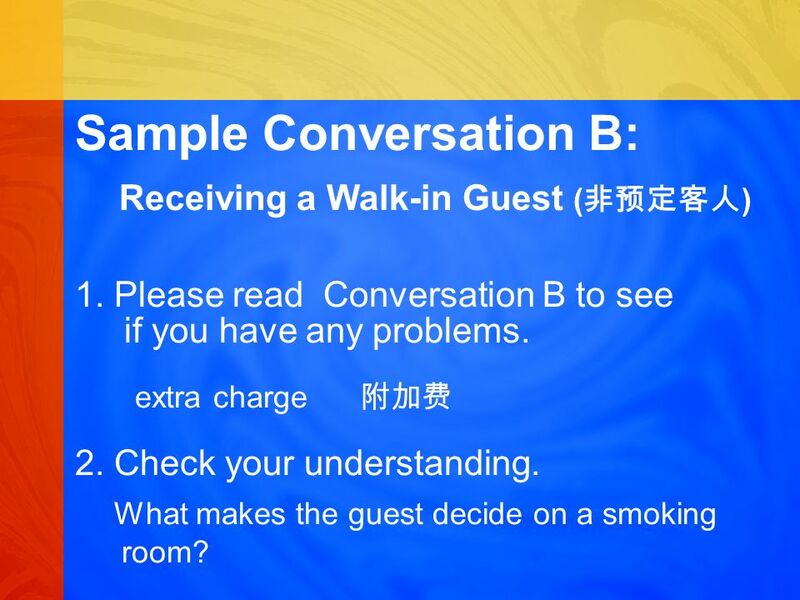 What makes the guest decide on a smoking room? 7 3. Check your understanding. a. What kind of room can he get? b. Why can he get a room to extend his stay? 9 3. Check your understanding. a. what time do they need the wake-up call? b. 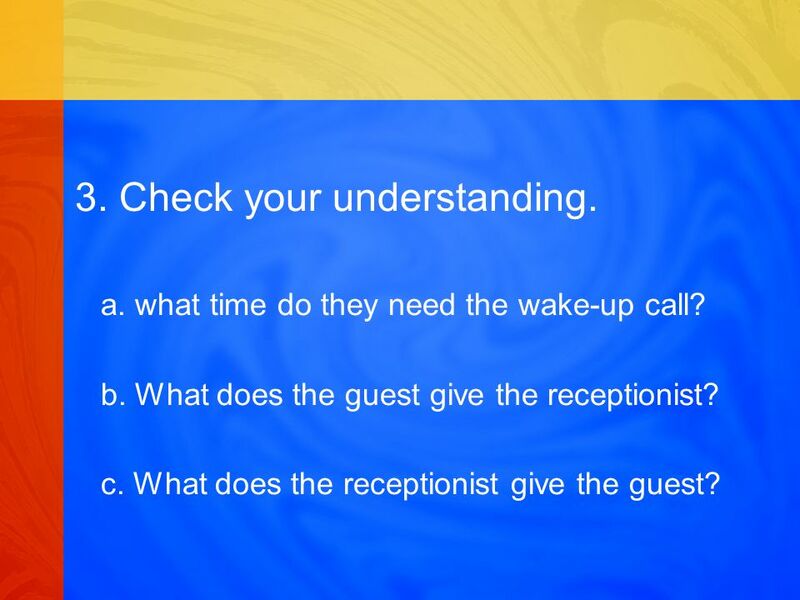 What does the guest give the receptionist? 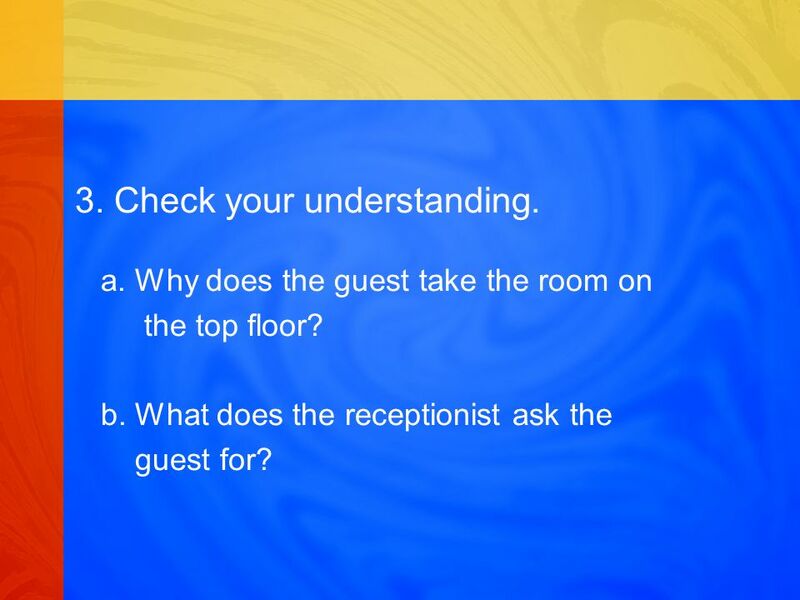 c. What does the receptionist give the guest? 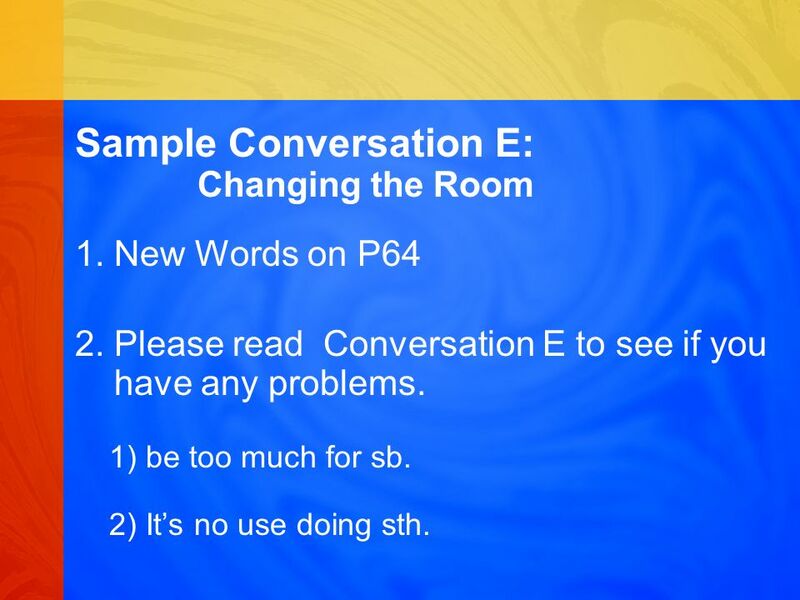 10 Sample Conversation E: Changing the Room 1. New Words on P64 2. Please read Conversation E to see if you have any problems. 1) be too much for sb. 2) Its no use doing sth. 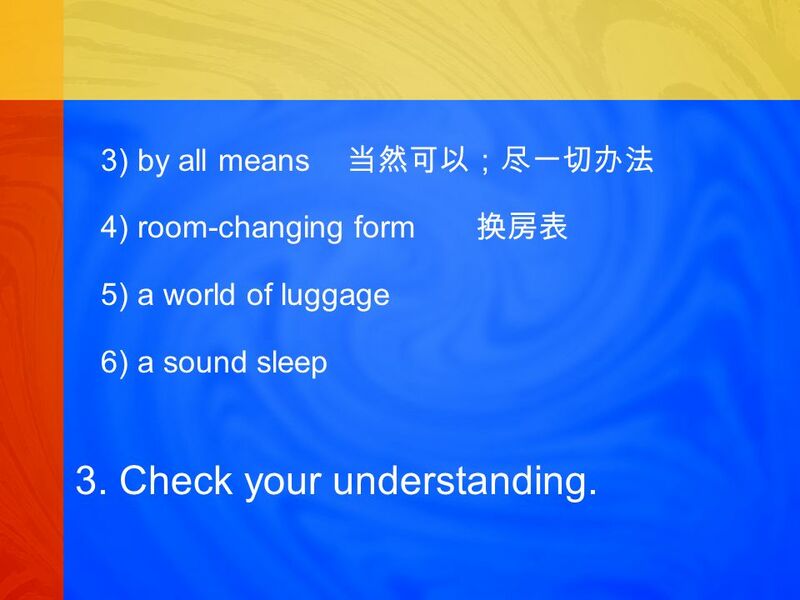 11 3) by all means 4) room-changing form 5) a world of luggage 6) a sound sleep 3. Check your understanding. 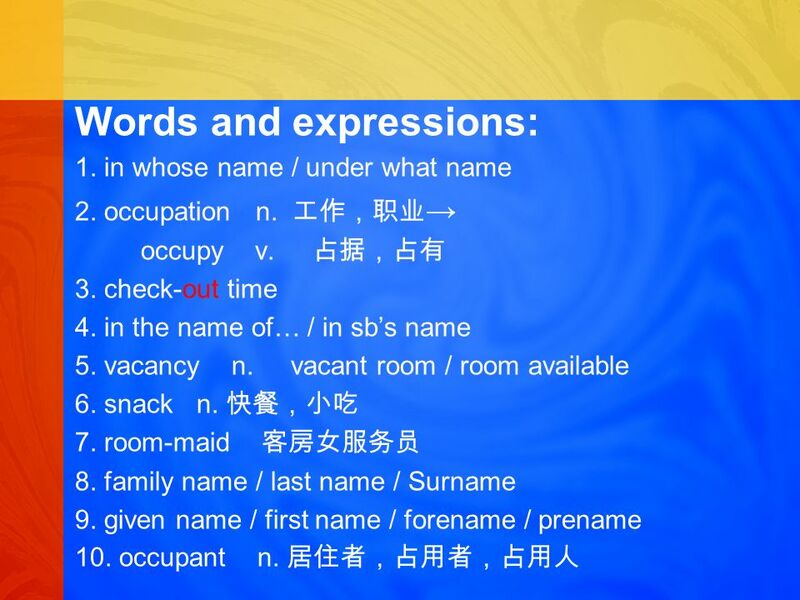 14 Words and expressions: 1. in whose name / under what name 2. occupation n. occupy v. 3. check-out time 4. in the name of… / in sbs name 5. vacancy n. vacant room / room available 6. snack n. 7. room-maid 8. family name / last name / Surname 9. given name / first name / forename / prename 10. occupant n.
Download ppt "Dictation 20 1. bell service / 2. Chief / Head Concierge 3. Concierge / Bell counter 4. contact number ( ) 5. country / area code / 6. health facilities." Dictation ATM: automatic teller machine 2. cashiers desk 3. credit limit 4. deduct …from… … … 5. expiration date 6. one check or separate check 7. Module 12 Summer in LA. Unit 1 Your host family is meeting you at the airport. 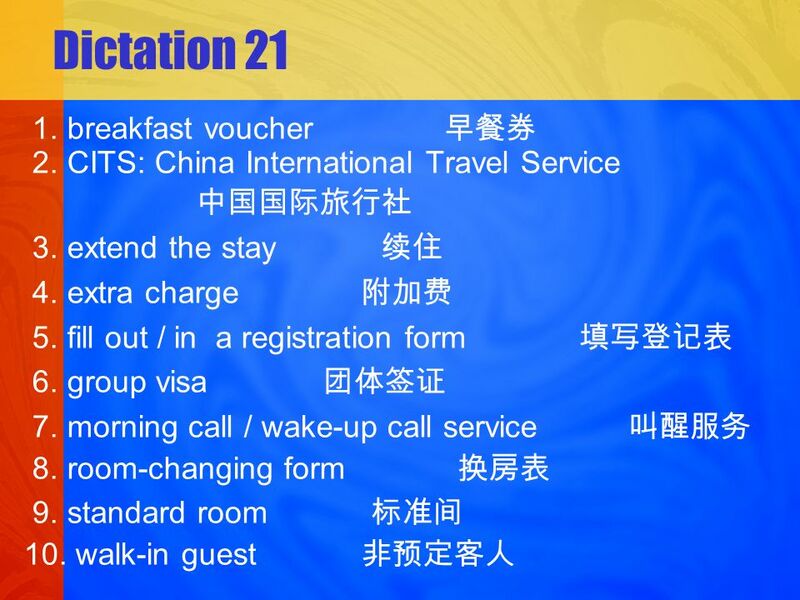 Stay in a Hotel Review Unit 3 L2~L3. Living ask for a room 1)single room 2)double room 3)suite ask for a bed 1)twin bed 2)double bed 3)queen-size bed. 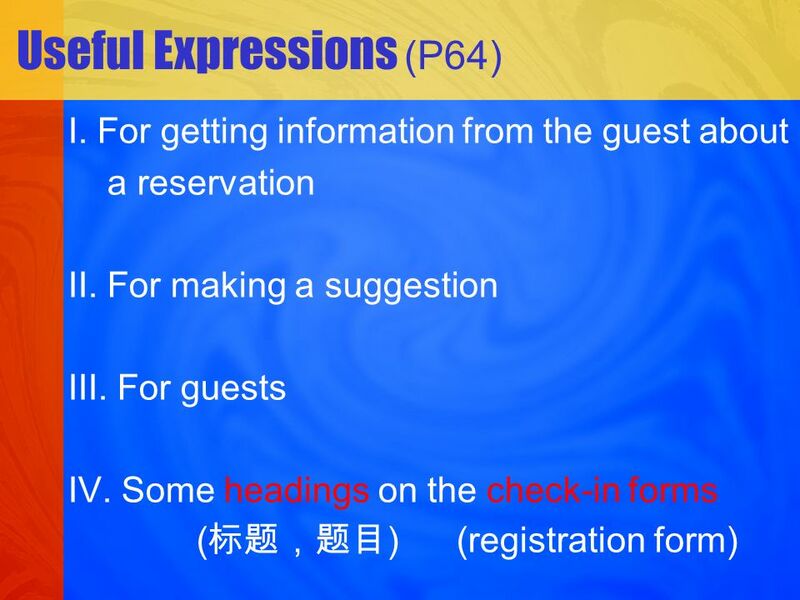 English For Hospitality. 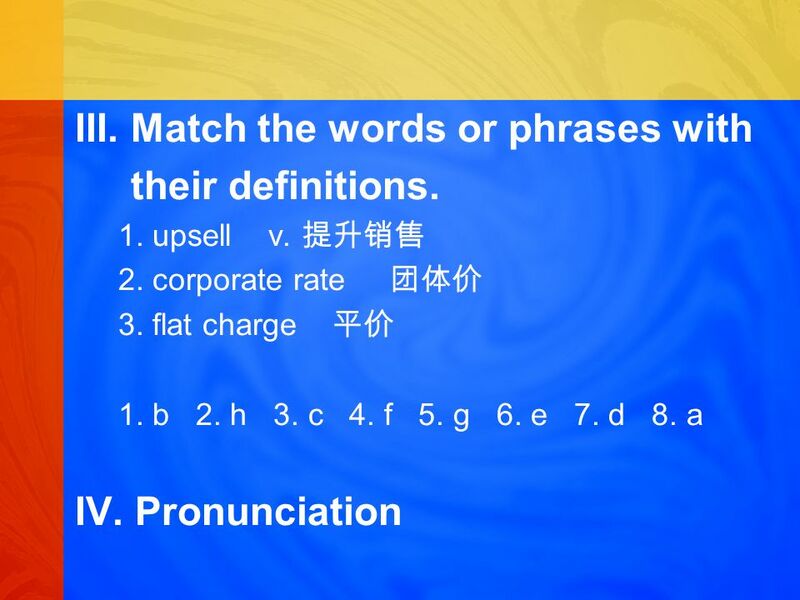 Topic 5 Bell Service. Task presenting. Task presenting. Task preparing. Task preparing. Task completing. Task completing. Further. 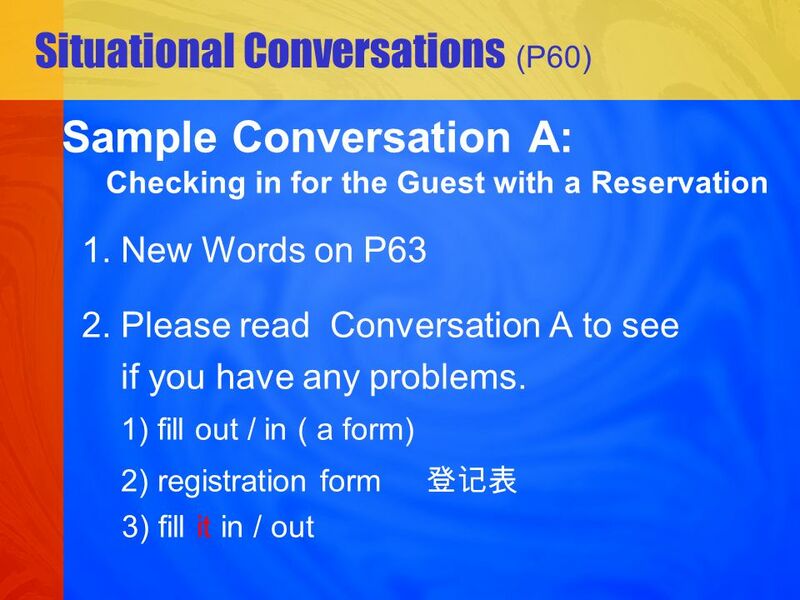 Conversation Practice Travel By Paul Chen. 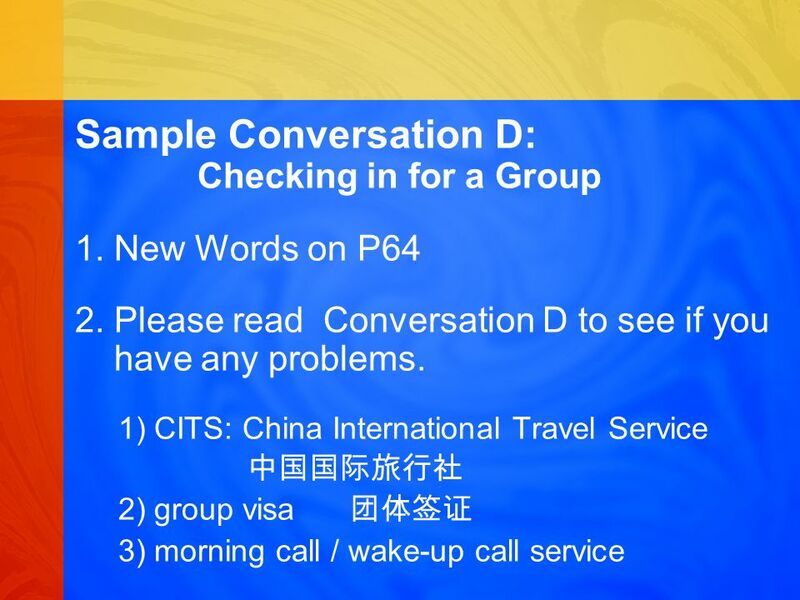 Outline Starting Questions Sample Conversations (1) Booking a Ticket (2) At the Immigration Office Vocabulary. The 14 Touches (of Guest Interaction) with Bill Bullard Inn at Occidental of Sonoma Wine Country Inn at Occidental of Sonoma Wine Country CABBI CABBI. Sequence of Front Office Service. 1.Jobs ’94 2. (Hong Kong) Careers Institute 3. (to) highlight three (interesting) occupations/jobs 4.assistant buyer Eagle Hotel managing director Marking. Extend a prompt greeting. “Welcome to Sylvan Spa…!” Use the guest name if known. Welcome them back if it’s not their first visit. Initiate check-in procedures. HOTEL MANAGEMENT The Guest Room. AGENDA  I. Value  II. 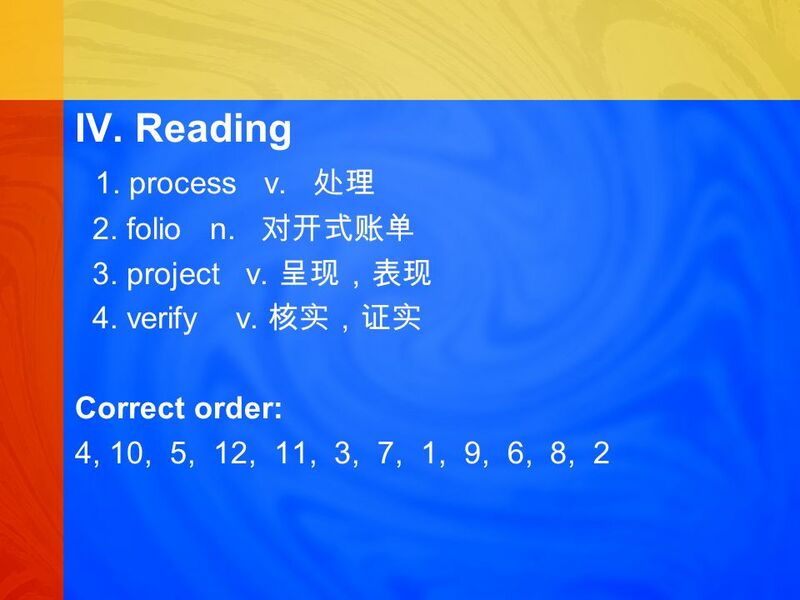 Value Selling  III. Evaluating Your Potential Guests  IV. Regrets & Denials  V. The Competition  VI. STAR Report  VII. The. Unit 3 College Education Searching for a Change. Objectives Focus Warming up 4.1 Giving directions 4.2 Talking about departments 4.3 Taking a message.